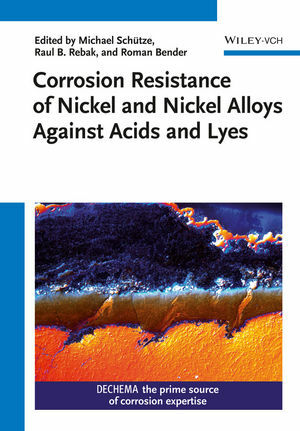 Derived from the online reference "Corrosion Handbook", this handbook brings together all the relevant information on corrosion protection and prevention for nickel-based materials, all in a convenient and easy-to-use format. As such, it provides scientists and engineers manufacturing and utilizing these materials with comprehensive information, including tabulated data and references, on their corrosion behavior when in contact with acids and hydroxides. Michael Schütze, born in 1952, studied materials sciences at the University of Erlangen-Nürnberg from 1972 to 1978, then joined the Karl Winnacker Institute of the DECHEMA as a research associate. He received his doctorate in engineering sciences from the RWTH (Technical University) in Aachen in 1983, completed his habilitation in 1991, becoming a member of the external teaching staff of the RWTH. Since 1998, he holds a professorship there. He was appointed director of the Karl Winnacker Institute in 1996 and Chairman of the executive board of DECHEMAForschungsinstitut in 2012. He is recipient of the Friedrich-Wilhelm-Prize, the Rahmel-Schwenk medal, the Otto-von-Guericke Prize, the Cavallaro medal, and the U.R. Evans Award, past Chairman of the Gordon Conference on Corrosion, editor of the journal Materials and Corrosion, Past-President of the European Federation of Corrosion, Past-President of the World Corrosion Organization and Chairman of the Working Party Corrosion by Hot Gases and Combustion Products of the European Federation of Corrosion. Raul B. Rebak, born in 1956, studied Chemical Engineering at the University of Misiones between 1974 and 1982. He then received a national scholarship to work at the Argentine Commission of Atomic Energy between 1983 and 1988. In 1989 he joined The Ohio State University Materials Science Department where he received a PhD degree in corrosion and metallurgy in 1993. From 1996 to 2000 he worked as a corrosion engineer at Haynes International in Indiana and from 2001 to 2007 at the University of California Lawrence Livermore National Laboratory. In 2007 he joined General Electric Global Research Center in Schenectady, NY where he provides his experience in corrosion science and corrosion engineering applications in areas such as nuclear, oil and gas, energy storage, aviation, etc. Dr. Rebak has more than 30 years' experience and published over 200 technical articles in corrosion. He is very active in technical societies and technical committees at ASTM International, NACE International, ASM International, TMS, etc. He is a Fellow of NACE International and The Corrosion Society. Roman Bender, born in 1971, studied chemistry at the Justus Liebig University of Giessen from 1992 to 1997. After he received his diploma he joined the Karl Winnacker Institute of the DECHEMA in Frankfurt (Main) as a research associate. Since 2000 he is head of the group materials and corrosion at the DECHEMA and editor in chief of the world?s largest corrosion data collection, the DECHEMA Werkstofftabelle, and the Corrosion Handbook. In 2001 he received his doctorate in natural sciences from the Technical University of Aachen (RWTH Aachen). In 2008 Dr. Bender was appointed chief executive offi cer of the GfKORR - The Society for Corrosion Protection. As well, in 2013 he has been appointed as the Scientific Secretary of the European Federation of Corrosion (EFC).